Six full service car rental agencies are conveniently located in the terminal. Each offering a wide array of car rental options, including larger multi-passenger vehicles, and fully equipped 4WD sport utility models to help you get to the slopes in style. Redmond's 132,000 square feet terminal showcases Central Oregon design elements that can be enjoyed while experiencing one of the region's award winning microbrews and freshly prepared meal at the Avalon Aeropub or while making those last minute travel arrangements online with the terminal's free wi-fi service. Airlines operating direct flight services to Redmond Municipal Airport. Many of the airlines offer promotional fares throughout the year and we encourage you to visit their websites to view the most current deals on airfare. RDM does not accept any responsibility or liability for delays to its services as a result of circumstances beyond its control including (but not limited to) traffic congestion, road accidents, flight delays, security alerts, and severe weather conditions. 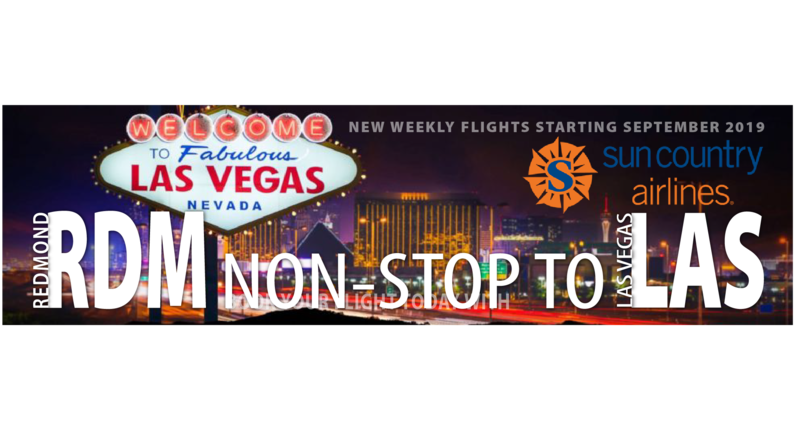 Beginning September 5, 2019 Redmond Municipal Airport (RDM) will welcome new operating air carrier Sun Country Airlines, adding two seasonal weekly nonstop flights to Las Vegas via McCarran International Airport (LAS). The new Las Vegas flights will become the region’s only direct commercial routes to Las Vegas, with fares as low as $69* one way. Flights are on sale now at suncountry.com. Redmond Municipal Airport (RDM) announces United Airlines (UA) will offer direct daily service to Chicago O’Hare International Airport (ORD) beginning June 6, 2019. The new seasonal non-stop flights will depart daily from RDM at 11:45 P.M., arriving in ORD at 5:15 A.M. Departures to RDM will leave ORD at 7:30 P.M., arriving in RDM at 9:45 P.M.
Redmond Municipal Airport (RDM) is located in the heart of Central Oregon and is currently served by four air carriers; Alaska Air, American Airlines, Delta Airlines, and United/United Express with daily direct flights to Denver, Los Angeles, Phoenix, Portland, Salt Lake City, San Francisco, and Seattle. RDM will offer United Airlines direct service to Chicago, beginning June 2019 and Service to Las Vegas (LAS) Beginning September 5th 2019 on Sun Country Airlines. Delta, United and United Express flights are handled by Delta Global Services. Alaska Air is handled by Horizon Air. American Airlines is handled by Envoy Air. RDM offers 27 daily commercial flights with long-term parking. We encourage visitors and residents to experience the convenience of traveling in and out of Redmond’s state-of-the-art terminal. The Airport is home to the USDA Forest Service Redmond Air Center, Life Flight, Leading Edge Jet Center, Les Schwab, Bonneville Power, Henderson Aviation, and Hillsboro Aero Academy. The public area of the terminal at the Redmond Municipal Airport (RDM) is open 24 hours a day, 7 days a week. Arriving and departing passengers are welcome to stay in the public areas of the airport to facilitate their travel needs, regardless of the hour. Only ticketed passengers are allowed beyond the security screening checkpoint. Although the airport terminal is open 24 hours a day, the businesses that provide services at the airport establish their own hours of operation. Please contact airport businesses directly for information regarding hours of operation. © 2019 Roberts Field - Redmond Municipal Airport, All Rights Reserved.